While Frank Miller has gone the gritty route with comics, Kurt Busiek has taken an homage route. Reading Astro City must be like reading comic books in the 50s. I'm kind of skipping around the series with this compilation but the nice thing about Astro City is that there is no dependence on years and years of backstory and continuity like Batman or Superman. And yet reading Astro City seems eerily familiar. The superheros seem vaguely familiar. That's probably to Busiek's credit that he's created a world that is new but so recognizable. Busiek explores the dark side of superheros in Tarnished Angel. Steeljack, a man whose skin has been transformed to metal, was a supervillain in his day. Now he's an older man (and looking a hell of a lot like Robert Mitchum) and remembering how his mom looked up at the superheros and thought of them as angels. Just out of jail, Steeljack is trying to go straight. But his only friends and the only people that accept him are the fringy element he hung with back in his younger days. In fact they hire him to find out who is killing the old super villains of the neighborhood. The answer to that question is a supervillain/superhero that has walked in Steeljack's shoes. They are a character studies in similar people choosing different paths. One of the more interesting interludes in the book is the Mock Turtle; a British supervillain who, as you can guess, looks like a turtle. But not a hulking, nefarious turtle. Rather a geeky and ugly turtle. This matches the man underneath the shell. He's another supervillain that isn't that far from being a good guy. With low esteem, he is walked over by others and in particular the Red Queen who uses him for her own desires. The whole sequence is well thought out from the costumes to the personalities to the tie-in to Steeljack. It seems a non-sequitar at first but it really strengthens the story. I come away from reading my second Astro City book thinking that if you ever wanted to start reading comics, Astro City would be the place to start. A limited amount of history and continuity to understand coupled with one of the best writers I've seen so far on my venture into comicland. Glad to see that Busiek's seminal work is crossing lines to people who aren't card-carrying comic-book geeks. You're right, he is a great place to start. I want to point out that Busiek's storytelling strength relies heavily on his artist cohorts. 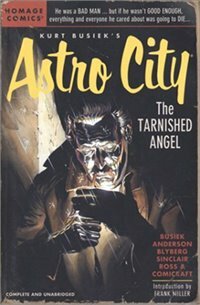 In the original run of Astro City, which is more epic and mythological than the Steeljack mini-story, the artwork of Ross and Anderson anchors Busiek's relaxed and lyrical approach to his subjects in a painterly realism (if there is such a thing) that you don't see as much in, say, the DC and Marvel universes. Another writer in the Busiek vein is Mark Waid. He's an old-school factory writer who apparently woke up one morning utterly inseminated by the Mythology Muse. With Alex Ross, he created Kingdom Come, a DC-universe maxi-series that utterly blows the lid off of traditional superheroism. There's genuine, meaty pathos in this work, and a thread of sadness that makes otherwise ridiculous people like Wonder Woman and Superman hum with Homerian greatness. If you like Astro City, you'll probably dig Kingdom Come. Also try Paul Jenkins, currently penning The Sentry, an obsolete and dated superhero he revived for maximum Heart of Darkness effect. You might also try Warren Ellis -- pretty much anything he does. He's rude, his superheroes are megalomaniacal demi-gods, and he's one of the best web diarists of any comic-book writer out there. His best work is The Authority, about a group of extraordinarily powerful superhumans who monitor world events from a living ship in orbit, making the sorts of decisions about mankind's safety that invariably lead to the annihilation of islands and continents. Occasionally shocking stuff. A riff on "What if Superman, with all his power, decided HE knew what was best for us mere mortals?" I oddly enough finished Kingdom Come a week ago. Excellent. Excellent, excellent, excellent. I'm a little peeved that apparently they're coming out with a Absolute version of this. Might have to spring for it. Ellis, as you'll see in some of my posts, just runs dry. He just seems like he wants to be too hip. Every character seems to have this urban look and speak to them and it feels forced and contrived. I don't know. It just didn't ring for me.